Fashion designer Donna Karan’s Central Park West apartment is “zen modern” inspiration. 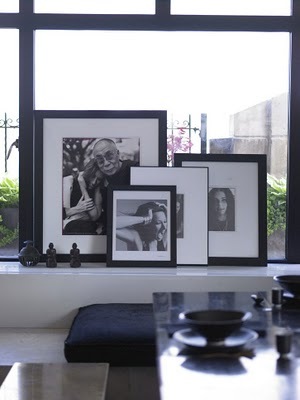 “My home celebrates my family and friends, art and culture, and it holds the memories that are a part of who I am,” says Donna Karan. Ms. Karan’s fall fashion is predominantly black which we see as a reflection of her sleek black and white interior space. What we love: The use of photography are, framed, standing in wide curtain-less windows in dining room and bath, the ladder towel rack in last photo, large artworks that practically span entire walls, and large cushioned window seats. This entry was posted in Celebrity Homes and tagged apartments, decor, Donna Karan, fashion, fashion designers, inspiration, interior design, interiors, living spaces, New York, photography. Bookmark the permalink.